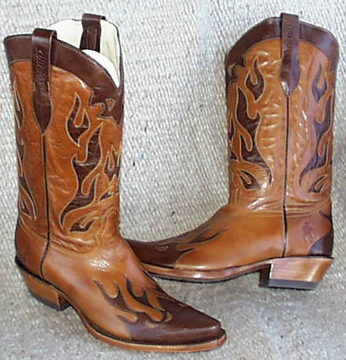 Men's Flame trim of fashion overlays & fashion inlays (Chocolate Flames) on Sierra Pull-up leather. Hand crafted leather boots. Cowboy Up wingtip, foxing & scallop patterns. Leather outsole on an all leather upper. Glove lining. 13 inch top. Handmade pointed (X) toe. Slightly underslung walking heel. Handcrafted. Hand made leather boots. Leather outsole on an all leather upper. Glove lining. 13 inch top. Natural leather sole & heel. Cowboy Flames Shaft Pattern.